ESO Supernova Exhibition — What does the X-ray Universe look like? What does the X-ray Universe look like? Only the hottest cosmological objects and the most energetic events generate X-rays. Studying them teaches astronomers about the violent Universe, where stars explode, black holes devour matter and galaxies collide. Dark and normal matter: Energetic X-rays (pink) are emitted by hot normal matter that has piled up where two clusters of galaxies have collided. The dark matter (blue) has mysteriously passed through the crash undisturbed. X-ray cycle: During the peak of its 11-year activity cycle (foreground left and right), the Sun emits many more X-rays than during solar minimum (background). 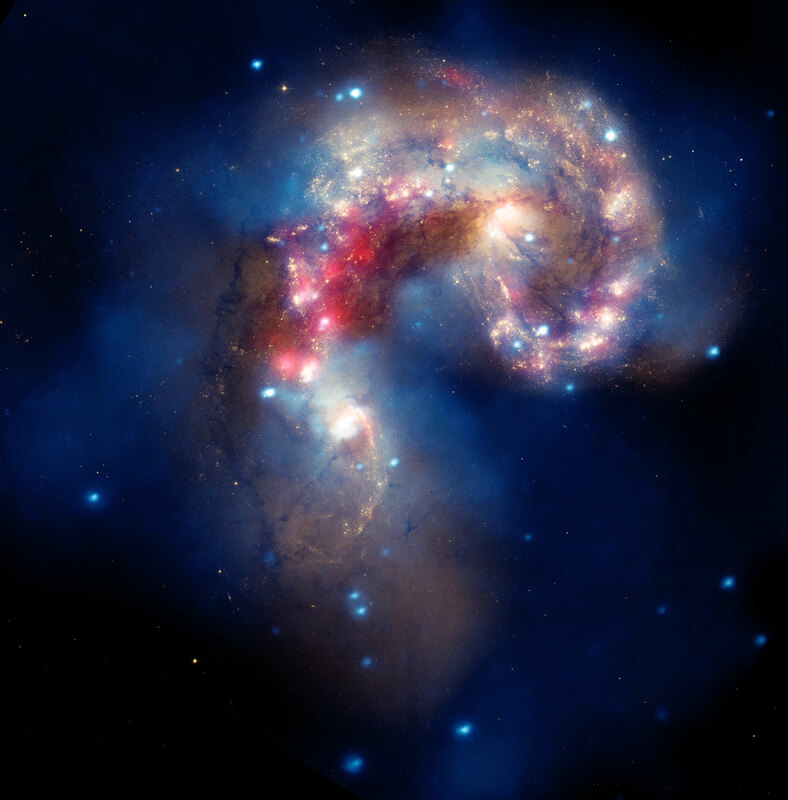 Hot halo: X-rays from extremely hot gas and from neutron stars and black holes in the Antennae Galaxies are colour-coded blue in this composite image. The hottest objects and the most violent events in the Universe produce high-energy X-rays: solar flares, neutron stars, cosmic shock waves, extremely hot gas in galaxy clusters, colliding galaxies and matter spiralling into black holes. The human eye cannot see X-rays. In fact, your retina would be destroyed by this energetic cosmic radiation. Astronomers use representative colours to create images of the X-ray Universe, based on observations by Earth-orbiting space telescopes. Glowing Andromeda: X-ray binary stars show up as blue and white dots in this composite image of the Andromeda Galaxy. The orange colour represents infrared light from warm dust. 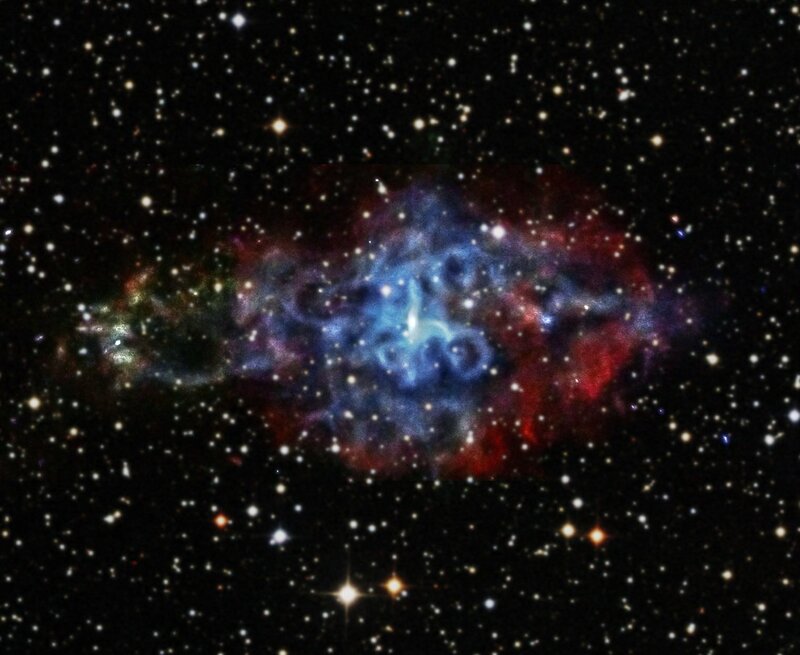 Explosion aftermath: Million-degree hot gas is colour-coded green and red in this X-ray image of Tycho’s supernova remnant – the expanding remains of a stellar explosion in 1572. Our ears cannot hear the high pitch of a dog whistle. In the same way, our eyes cannot see X-rays coming from space. The pictures here show what you would see if you had X-ray vision.